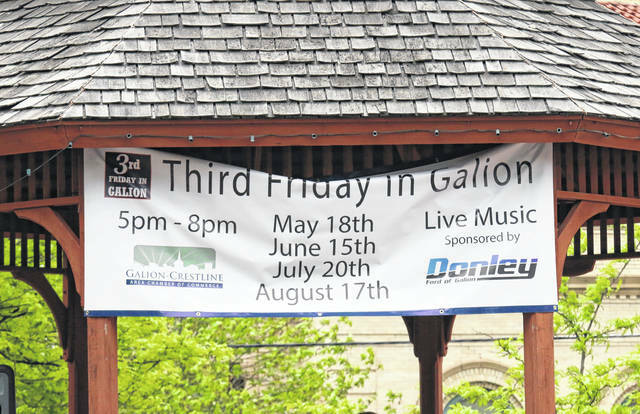 GALION — Third Friday in Galion, for the month of June, is prepared to bring new events for all ages to uptown Galion this Friday. There will be a pitching contest held in front of United Bank on the public square for any current players in the Galion Youth Baseball league. All players who participate will receive a ticket to attend a Galion Graders home game this season. The player who throws the fastest, most accurate pitch will win the opportunity to throw out the first pitch for the Graders’ game that evening at Heise Park. The throwing contest starts at 5 p.m., game-time for the Graders is 7:05 p.m.
Another addition to TFIG this month is in the form of community artistry courtesy of Brush and Palette Art Gallery. Artists will be working in five to six locations across uptown Galion to create chalk drawings and murals. The gallery will also be designing an oversized game of hopscotch in Cider Alley in the 100 block of Harding Way East. Galion Community Theatre will also be showing Disney’s movie ‘Enchanted’ at 8 p.m. This is a family-friendly event open to all ages. Entertainment at the Gazebo will kick off at 5 p.m. with performances by members of the Galion Community Theatre, followed by entertainment by Eagle Dance Center at 5:30. A local Galion band will perform at 6 p.m., followed by local young musicians Common Thread at 7 p.m. All performances are sponsored by Donley Ford of Galion. The Covert Food Court will be set up once again along North Market Street. Sponsored by Covert Manufacturing it will include fare by Rus-Men Farms, East of Chicago Pizza, and Bistro 217. Mark’s Homemade Ice Cream will also be on hand as the food court will have something to feed anyone’s palate. Members of the Galion High School Football team will be selling their fundraiser discount cards this month along with approximately 20 other vendors and a Farmer’s Market. Proceeds from the discount cards go to support the cost of attending football camp for members of the GHS football team. Erin Miller | Galion Inquirer The second installment of Third Friday in Galion hits is this Friday June 15 beginning at 5 p.m. with plenty of fun for all on tap. https://www.galioninquirer.com/wp-content/uploads/sites/38/2018/06/web1_IMG_3664.jpgErin Miller | Galion Inquirer The second installment of Third Friday in Galion hits is this Friday June 15 beginning at 5 p.m. with plenty of fun for all on tap.